Tpruvot has made an official release of his updated ccMiner fork (source) version 1.8.1 along with Windows x86 and x64 binaries available for download. The x86 Windows binary is compiled with VS2013 and CUDA 8.0 RC and the x64 binary is compiled with CUDA 7.5, it is best to use the latest video drivers to have support for CUDA 8.0. 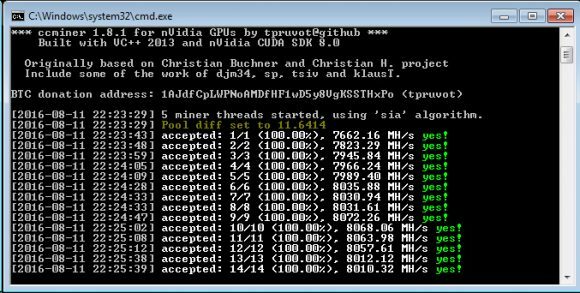 The new ccMiner 1.8.1 adds support for mining Siacoin (SC) on Nvidia GPUs using CUDA, SIA uses Blake2-B algorithm, though at the moment different pools still seem to rely on different protocols for mining and not all of them are yet supported by ccMiner. The miner supports the SIA Nanopool RPC (getwork over http) as well as the getwork over Stratum implementation of Suprnova, but not yet the Siaminingpool stratum protocol (you should still be able to mine there via getwork). The hashrate seems to be slightly better than that Sia Go Miner that uses OpenCL and also works on Nvidia GPUs. The new version 1.8.1 also comes with small improvement in the LBRY hashrate improvements (by alexis78) over the previous release 1.8 that introduced Library Credits mining. So if you are mining LBC with Nvidia GPUs, then you might wan to update to the new release in order to get slightly better hashrate. The Lyra2RE support has also been updated with the with the Nanashi Meiyo-Meijin improvements, so it should be faster than before.